Here is the ultimate 'fancy rice' for a special event. This delicious recipe uses channa cheese balls, which can be made from either cow or goat milk. Here is a video on how to make chenna cheese. Generally chenna is softer than paneer due to not having been pressed or hung for as long. Since this is a relatively complex recipe in that it has a number of steps, we decided to take a series of photos to make the process easier. Please give it a try! It's delicious and well worth the effort. Thanks to chef Scott Bears for making this dish and Nicole Herbert for taking the photos! Place warm chenna on counter and knead out extra moisture, knead until creamy and knead in flour. Scrape cheese into a ball. With film of oil on hands divide into 5 portions and roll each into 10 round balls - set the 50 balls aside on a plate. Place nuts, coconut and raisins in individual mounds on a plate and set aside. 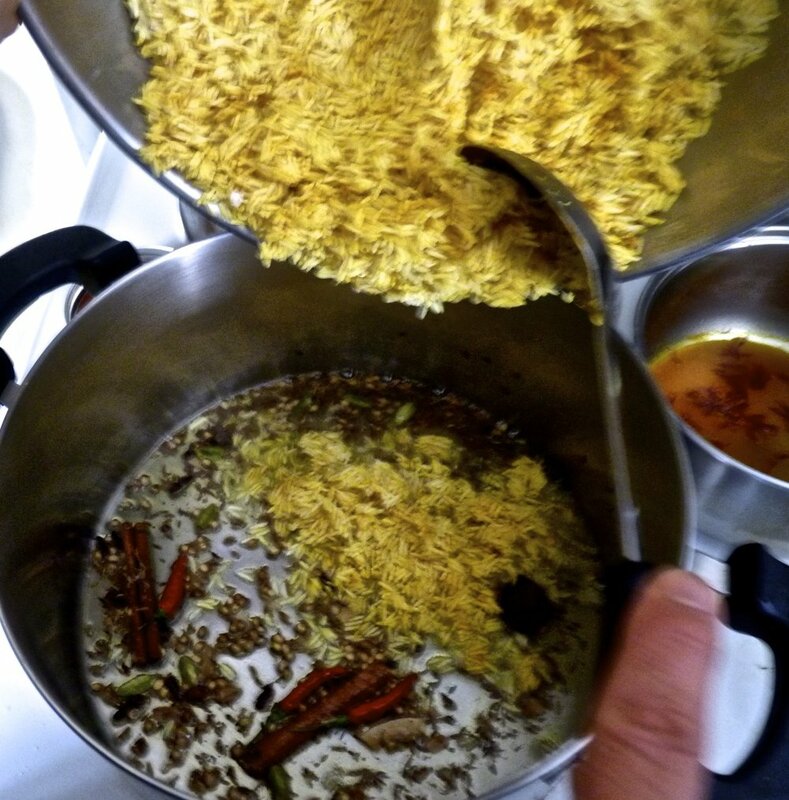 Place rice in a bowl and add 1 Tb melted ghee and turmeric. Mix together and set aside. 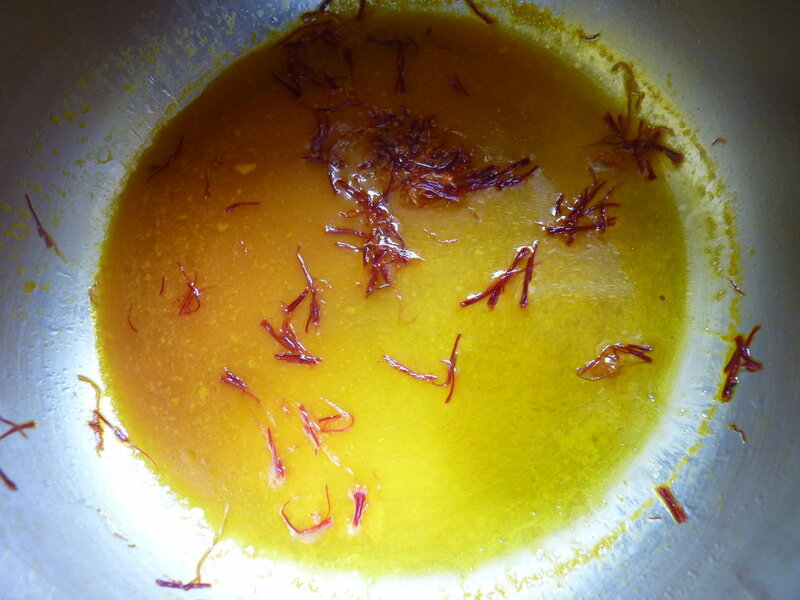 Heat milk in a serving spoon, transfer to a small cup and soak saffron threads until needed. Heat ghee/oil to a depth of 2" in a frying pan over moderate low heat. When oil reaches about 325' F fry one by one the mounds of nuts and coconut until each turns golden brown. Fry raisins until they turn plump and a few shades lighter. Remove each batch with a slotted spoon and place in a medium sized bowl. Raise heat to moderate and cook cheese balls in two batches. Cook them for ½ minute, then move balls with a chopstick until they rise to surface. Continue frying using a slotted spoon, and fry until rich golden brown on all sides. Remove with slotted spoon and hold aside. Remove ghee/oil from heat, put 4 Tb in a heavy saucepan over moderate heat until hot (not smoking). 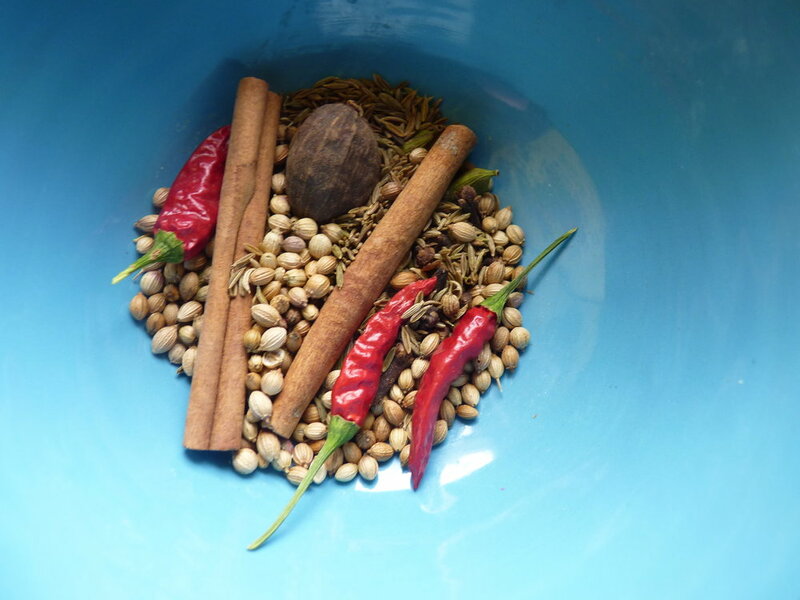 Add cloves, cinnamon, cardamom, chilli, cumin and coriander seeds and kalonji. Fry until cumin seeds turn brown. 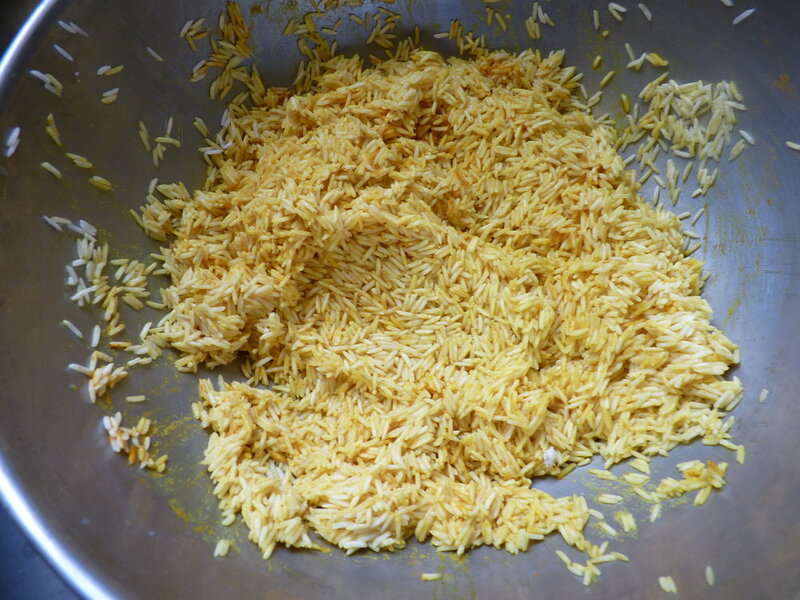 Stir in hing, then quickly add turmeric-coated rice and salt. Stir-fry 2-3 minutes. Add water and bring to a boil. Pour in fried nuts, raisins, coconut and saffron milk, stir well. Reduce heat to low, cover and gently simmer 20-25 minutes or until rice is done. Remove from heat and let sit covered for 5 minutes. Add remaining 2 Tb ghee and fried chenna balls. Gently fluff rice and mix ingredients. Source: Yamuna Devi, Lord Krishna's Cuisine: The Art of Indian Vegetarian Cooking (New York: E.P. Dutton, 1987). Fry the chenna cheese balls. Voila! Yummy fried chenna cheese balls! Mix the rice with turmeric and ghee. Soak the saffron threads in milk (or water). Fry the nuts and raisins. Gather the spices and then fry them.